Capitalising on the popularity of a classic story is perhaps the only explanation as to why this novel was written. Legacy of the Daleks revisits the Earth of The Dalek Invasion of Earth - almost exactly, but seemingly even less technologically advanced. 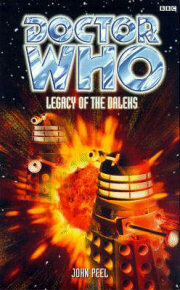 Legacy of the Daleks is a bizarre montage of different eras, with knights on horseback complete with impractical armour and Lords that rule from castles over warring domains. The Doctor could almost have walked onto the set of Days of Our Lives; albeit one laden with Doctor Who characters and continuity (although the former could often be a spurious claim). This novel feels like a big-budget Hollywood blockbuster, with gun-toting masochistic ex-husbands wielding extreme power, sexual innuendoes and past lovers out for revenge. The character of Brittany is simply cringe-worthy. John Peel writes in such a way that everything his characters say is a double entendre, apparently, a point made obvious by the fact that the characters stress it themselves. The Doctor himself is a bit of a chauvinist, but perhaps this is only a shadow of the Third Doctor, for whom this novel was once intended. He barrels about like the Sixth Doctor for the first half of the novel, prying into everybody's personal lives and taking sides instantly in a conflict of which he has only heard a biased opinion. This isn't the Eighth Doctor and he is barely recognisable. The Master is the most two-dimensional he has ever been, which is a shame after his excellent characterisation in The Dark Path, and for all intents and purposes, Susan may as well be human. Her reunion with the Doctor is surprisingly handled, and is about the best aspect of the story.